Over Christmas Kelly and I debated about what we would get each other. Normally we set a amount on presents and buy whatever we think the other person will like. However this year, I volunteered a different option. Reading my “Things to do in Chicago” email from Chicago Magazine, I saw a line about a new performance in town called, Potted Potter: the Unauthorized Harry Potter Experience: a Parody by Dan and Jeff. The play captures its audience, young and old, by condensing all seven Harry Potter books into one 70 minute comedic performance using only two actors. Intrigued, I forwarded it off to Kelly for her thoughts. She responded that she would be interested to see the play. However, naturally with both forgot about it. 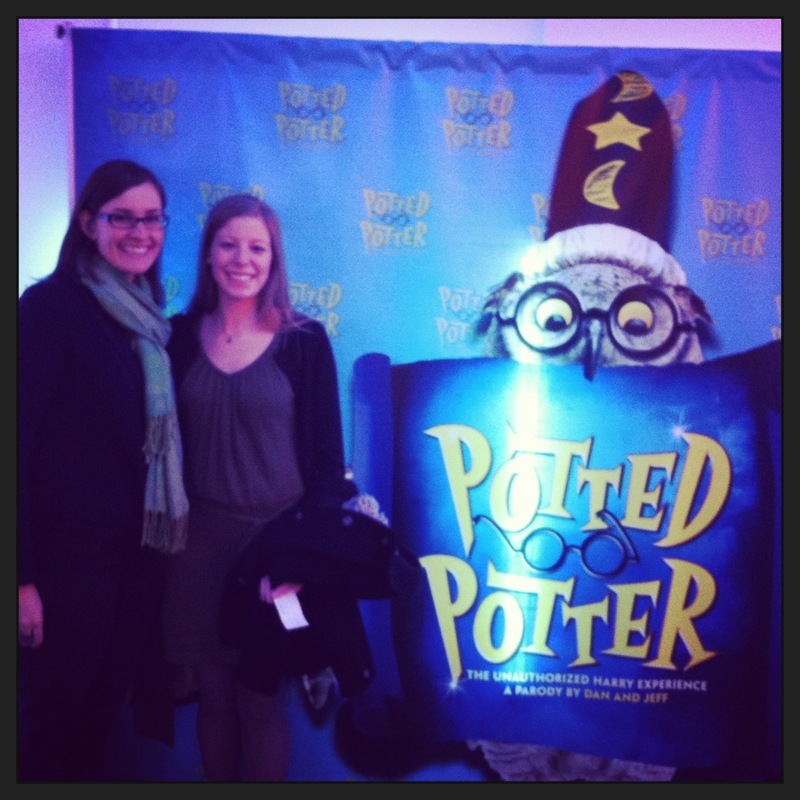 Until I saw a Groupon for orchestra seating tickets for “Potted Potter”. So I called Kelly immediately. We both booked our tickets at the same time. Unfortunately, we booked separate tickets. It’s wasn’t exactly our greatest moment. I tried calling the box office right after we booked, but they were unable to move our seats. Oh well. We saw the play this past Sunday at the Harris Theater for Music and Dance. We both had never been to this theatre before and found it very unique and modern. 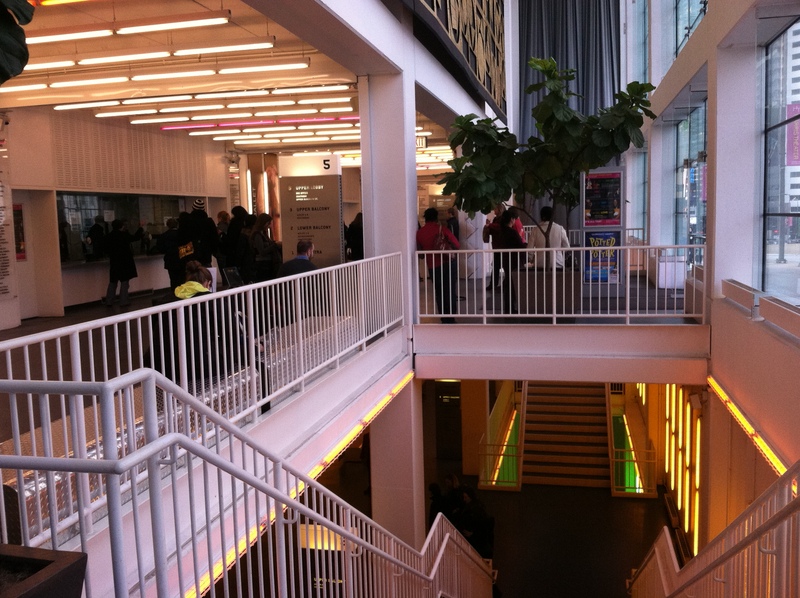 Located just off Millenium Park, we entered the building at street level and were told to head down to the third level. Somehow I managed to pass up the opportunity for Butterbeer, maybe it was the $7 price tag. We headed into a good size theatre that reminded me of the First Midwest Bank Amphitheater but indoor. We found our seats only three rows apart and sat down to enjoy the show. Right before it started, Kelly hailed me down because there were two open seats next to her. Woohoo! I won’t spoil the show with what happens so you should go see it. The two actors used their creativity to portray over 100 characters, which was no simple task. Plus, how the actors used the stage and the audience was impressive. If it comes back to town I’m totally taking with my mom and any other Harry Potter friends! The Oriental Theatre in Chicago is probably one of my favorite theatres. The theatre opened on May 8th, 1926, and has captivated audiences with motion pictures which over the decades gradually transitioned to Broadway productions. The interior design for the theatre was heavily influenced by…can you guess? The Orient! Over the years, I’ve enjoyed seeing multiple performances of Wicked and most recently, American Idiot at the theatre. One nation controlled by all the media. Lyrics from the song, American Idiot, by the band Green Day. Everyone has the own interpretation of music. 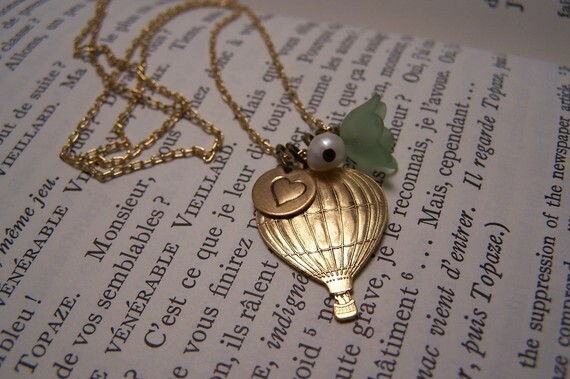 People seek understanding through metaphors and similes. Sometimes it’s pretty easy to figure out, and other times you need the cliff notes guide. In my opinion, Green Day’s lyrics are pretty explicit. There is no real wiggle room for what the band is singing about. It’s a call to attention about the current state of America and encourages its’ residents to not be passive. This idea clearly came out in the Broadway performance. But I will say, that without a doubt, the play was not at all what I was expecting. Why? I know it’s a musical so the majority of time there is going to be a lot of singing. However, more dialogue would have helped the viewer understand sooner what is exactly was happening. One thing I did really like was the stage design and choreography. The stage was set with a few standard objects, one of which was a multi-story staircase that at one point was turned into a bus simply by flipping it around and cast members climbing inside to “ride” the bus. Pretty darn creative. Would I go see it again? Probably not. The show lacked a captivating emotion that is successfully conveyed through other classic musicals and even other modern performances. Am I glad I saw it? Yes. I’m a fan of Green Day and was curious how the album was translated to a full on musical. The show is definitely a unique production looking at modern day society with great acting and music. 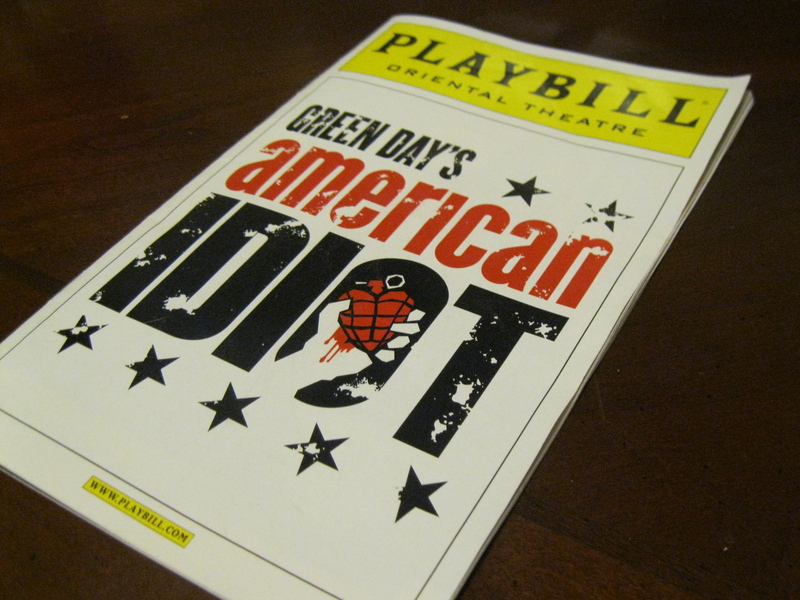 Next time you’re in New York or American Idiot comes back to Chicago, go see it and let me know what you think! Shakespeare is one of my favorite classical authors. His stories weave complex tales filled with layers of themes, motifs and symbols. My top three favorite plays are Much Ado About Nothing, Taming of the Shrew and Twelfth Night. As you can see, I lean slightly more towards comedy but I do enjoy a good Hamlet or Henry IV every now and again. His works of comedies, tragedies and histories show human nature in a way that for the past 400 years are still relevant. Plus he’s British and I have a ridiculous love for anything English – including tea and digestive cookies. Local Chicagoans are extremely lucky to have the Chicago Shakespeare Theatre in our backyard. 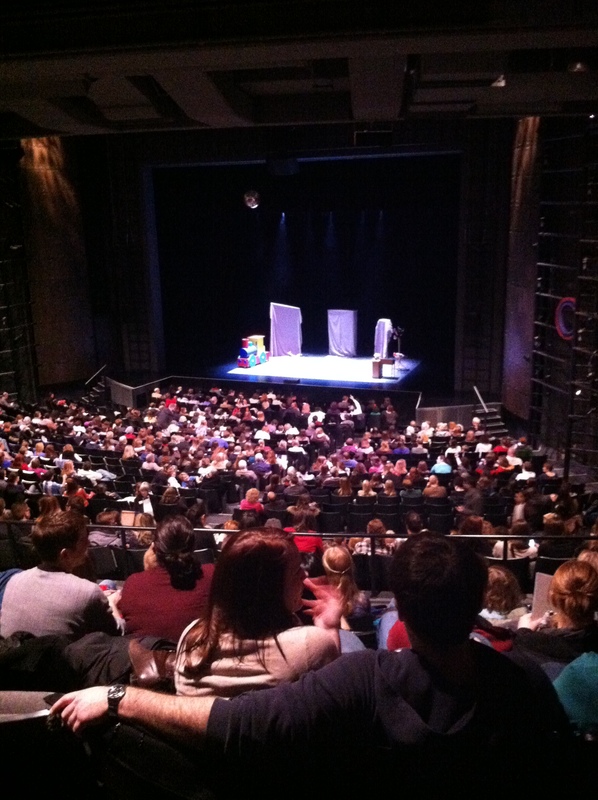 Settled since 2000 on Navy Pier, CST’s facility is modeled after the Globe Theatre, leaving no “bad seats” in the house. 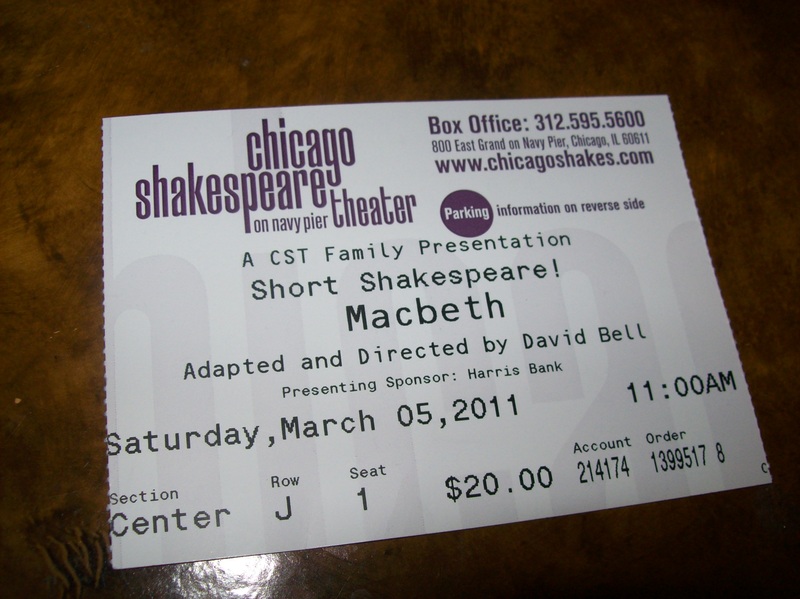 I can say that for a certainty after attending over a dozen performances, including one this past weekend – Macbeth, a 75 minute Shakespeare Short. Every time I have been to a performance of CST my expectations are exceeded. From the actors’ performances, to costume and stage design, and the seeing a completely new interpretation of a classic continually blows my mind. Each experience is powerful and wonderful, which is why I go back at least once a year to see a performance. All the actors wore dark costumes with Gaelic symbols woven with red fabric. The use of a huge red silk piece of fabric that would engulf the entire stage during battle scenes. CST achieved a hostile stage environment that was still appropriate for children. I thought it was brilliant. And the 30 plus students who were there, ranging from elementary age through high school, thought so too by their applause. Check out www.chicagoshakes.com/ for performances.